Standard suburban pub - family friendly with a decent food selection. 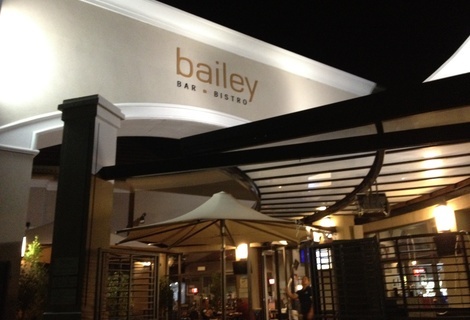 Bailey Bar & Bistro was reviewed on Tuesday 29th January 2013 19:43 by Richard. If you haven’t been to Joondalup in a while you’d hardly recognise it. The shopping centre has just about tripled in size, a bunch of small restaurants and cafes have recently opened their doors and most importantly some of the old ‘dives’ have been given a face lift to keep up with the times. The Grand Boulevard Tavern (GBT as it was known by the locals) has been reopened as the Blvd Tavern and The Old Bailey has transformed into the Bailey Bar and Bistro. A group of about 15 of us visited the latter for a good mate’s leaving dinner on Tuesday night. I may be mistaken, but other than a few branding/signage changes here and there, not much has changed in The Bailey, I could be wrong though. In any case, the decor is that of most semi-modern suburban pubs around Perth, simple clean and no frills. The pub was mostly occupied by young families, except for the TAB/Sports Bar at the front, which had a slightly ‘rougher’ crowd. We arrived a bit early and were shown to our table by a friendly waitress, who explained the ordering process (you order food at the bar and when it’s ready it’s brought out to your table). I’m not a massive fan of this style of service, it does however beat the retched ‘buzzer system’. Although I’d have to admit I was a fan of it on this particular night due to the fact I was absolutely starving and being able to order when I was ready was awesome. I didn’t have to wait for the whole table of 15 to make their minds up. The menu had a good selection of pub standards (steak sangas, salt and pepper squid, parmies etc) as well as some more ‘exotic’ options; Moroccan spiced lamb and Saffron linguine. They even had a kids section which you don’t find all that often these days. Although very tempted by the lamb, I ordered the Tuesday night special, a 300gm Black Angus Rump steak served with garlic sauce, chips and greens ($16.50) and my girlfriend had the chicken caesar salad – sans anchovies ($22). Most of the table ordered the steak special but I did see the odd pizza floating around which looked very tasty too. Our food came out in under 20 minutes, fairly impressive considering the pub was far from empty and all of us had ordered at about the same time. My steak was very good, cooked exactly to my order – medium rare, and was surprisingly lean and not as chewy as I had expected from a rump. I loved that they only put a small helping of chips on the side too, if they’d put more I undoubtedly would’ve annihilated every last one and left the pub feeling way too full. The chicken ceasar was also damn good, not over dressed as so many caesars seem to be and the chicken was cooked perfectly with a nice grilled flavour to it. Overall the value seemed to be quite good (not just because my steak was on special). Almost all pints of beer were under $10 and most meals were around $25 -30. I’d definitely recommend swinging by The Bailey the next time you find yourself in the Joondalup area and, if you have them, why not bring the kids along too. 8/10The Sovereign Arms in Joondalup, WA (238m away)Joondalup's new age British pub - Good pub food and friendly service.